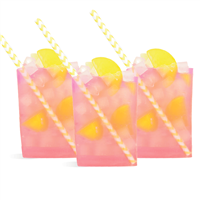 This strawberry lemonade soap will make you want to sip down your favorite summer beverage. 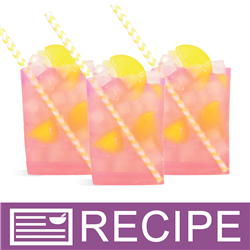 This soap bar features the layering “ice cube” technique as well as a cute embed straw and is scented with one of our summer favorite fragrance oils, Strawberry Thyme Lemonade! To a microwave safe-measuring cup, add 5.90 oz. of cut up clear MP soap and 0.10 oz. of white MP soap. Heat in microwave until melted. Stir well and pour into Itty Bitty Cube Silicone Mold. Place in refrigerator until hard. Once completely hard, unmold soap and set aside. To a microwave-safe measuring cup, add 6 oz. of clear MP soap. Heat in microwave until melted. Add banana boat yellow mica powder. Stir completely. Pour soap to fill fruit slices mold and allow soap to harden completely. Once soap is hard, unmold. Once soap is hard, unmold and set aside for later. To beaker, mix fragrance and stabilizer and allow to sit for two minutes. Add 29 oz. of cut up clear soap to a large microwave safe-measuring cup. Heat until melted, stirring occasionally so that the soap does not overheat. Add strawberry color and fragrance mixture and stir completely. Pour just enough soap to cover the bottom of the tall & skinny loaf mold. and space the next straws each 1” apart. Once bottom layer of soap is hardened and straws are secured, spritz with alcohol and pour another inch of pink soap. Grab a handful of cube soaps and spritz with alcohol. Add soap cubes until layer of pink soap is covered. Spray next layer with alcohol and pour more pink soap. 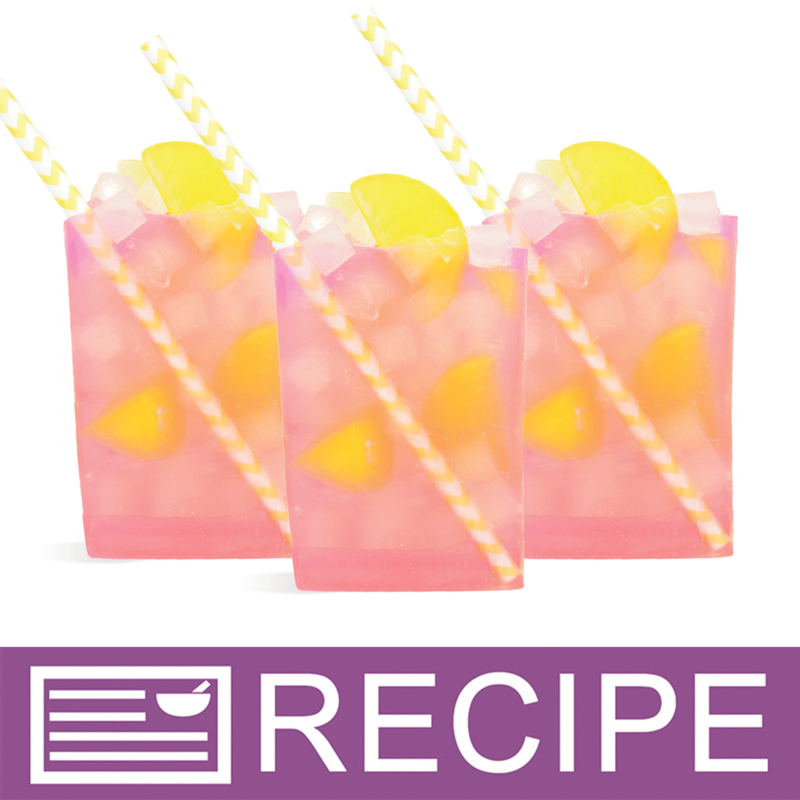 Spray four citrus slice soaps with rubbing alcohol and add to pink soap. Add more ice cube soaps, sprayed with rubbing alcohol, until layer is covered. Repeat steps 17-20 until mold is full and slightly overflowing with ice cube soaps. Save eight citrus slice soaps and a small amount of pink soap for the top. After spraying the top of the soap with alcohol, pour the small remaining amount pink soap over top. Spritz citrus soaps and place in line with each of the eight straws. Allow soap to completely harden. Carefully remove soap from mold. Slice into bars. Wrap with plastic wrap or desired packaging. To Use: Remove straw before use. Lather onto wet skin and rinse off. Ingredient Label: Sorbitol, Propylene Glycol, Sodium Laureth Sulfate, Stearic Acid, Myristic Acid, Lauric Acid, Water, Sodium Hydroxide, Sodium Cocoyl Isethionate, Glycerin, Fragrance, Titanium Dioxide, Tetrasodium Methylparaben, Propylparaben, Red 33, Mica, Iron Oxide.